Many assume all trash ends up in a landfill or unfortunately, in our oceans, but in one European city they're turning the city's plastic debris into something their community can actually use - a floating, public park. Recycled Park is a floating park in Rotterdam, the Netherlands, made entirely out of recycled plastic collected from the same river its now floating in. 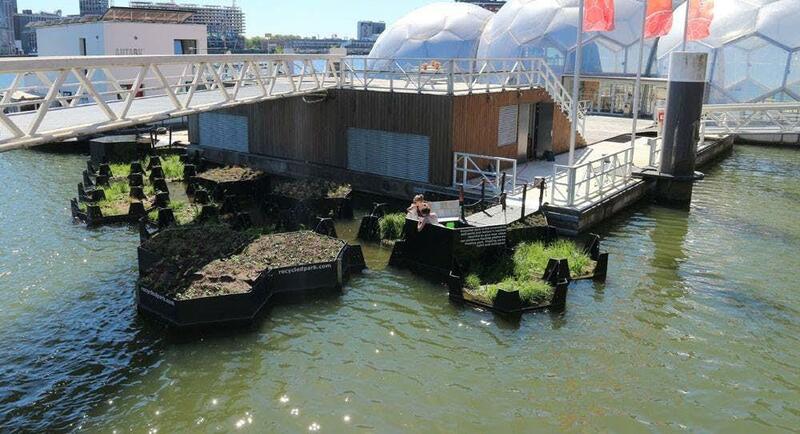 Not only is it a unique space for the community to visit, but the floating park also cleans the Nieuwe Maas River, stopping plastics from the city before they make their way towards the ocean. Almost five years in the making, from designing the park to recovering plastic, turning it into something new, and raising funds, Recycled Island Foundation finally debuted the park prototype earlier this month on July 4th. The park has been constructed from modular hexagonal sections, meaning that it can continue to expand as new material is collected. Not only does the park serve to reduce plastic pollution but it's also designed as a wildlife habitat for micro fauna such as snails, flatworms, larva, beetles and fish. “This prototype shows the potential of what we can do with marine litter. 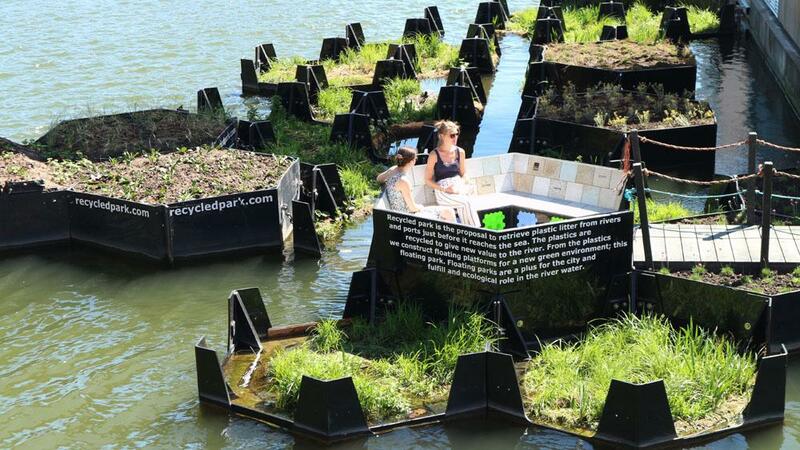 Recycled Park is a floating green structure where birds are nesting, fish are swimming, and where people can enjoy a relaxing moment on the water. From the two seating elements the visitors can see how nature occupies this first new combination of artificial and natural landscape,” the project’s creator Ramon Knoester told Lonely Planet. The Recycled Island Foundation and 25 partners ultimately created the Recycled Park, setting traps along the Meuse River to gather plastic waste then transform it into the 28 hexagonal blocks that make up the park. The team spent a year and half developing, testing, and improving the litter traps, eventually developing a system to capture floating plastics in rivers and ports. Their litter trap captures and contains floating litter despite ship traffic and tidal changes. Recycled Park isn't the only project around the world where people are considering the environmental impact of pollution in their local area. More individuals and communities around the world are looking to find creative ways to reuse plastic in ways that highlight the plastic pollution problem and challenge its viewers to consider how their lifestyles impact the planet. Indonesian artist Eko Nugroho turned plastic waste into a beautiful art installation dubbed "Bouquet of Love" - a 30' by 20' sculpture made entirely from plastic waste. One provocative art installation in the Himalayan mountains used over 300,000 plastic bottles left behind by tourists. These unique creative projects aim to highlight how fewer than half of our total plastic bottle consumption is recycled. 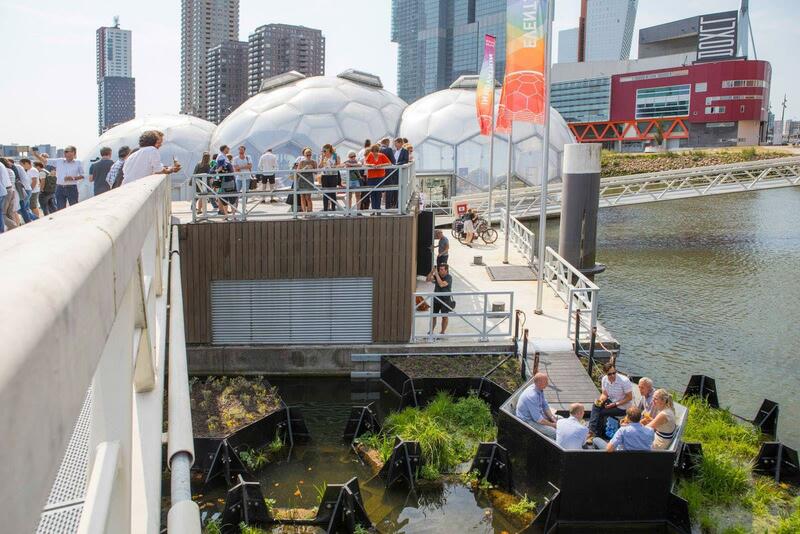 At Recycled Park in Rotterdam, the floating park contributes to greening the city and the improvement of the ecosystem in the Rotterdam harbor. They're currently seeking a permanent location.